This week we reached an important milestone in the War of 1812 Pension and Bounty Land Warrant Applications project we’re working on with the Federation of Genealogical Societies (FGS) and the National Archives. The files are arranged in alphabetical order by the last name of the soldier, and this week we’ve finished with the A’s and started work on soldiers whose last names begin with B.
Prepping, filming and indexing these paper documents is slow and expensive work, but FGS has been raising money, we’ve been matching it and we’re making our way through the boxes of paper. There are now over 95,000 images available on the site. Getting the images from paper takes more work, but the end result is beautiful color images that tell amazing stories and provide helpful insights. 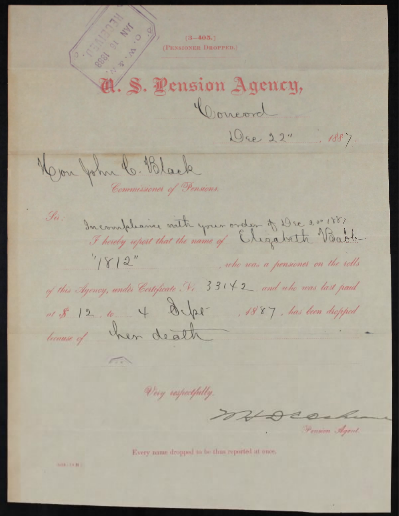 After September 4, 1887, Joseph's widow Elizabeth's pension was "dropped because of her death." According to another document in the file, Elizabeth Babb died on 14 September 1887, but there was "no public record of this death." This document from the file includes a letter from Elizabeth's daughter, confirming her mother's death date and providing more details. That you for all the work in making these records easily available to the public. I’ll keep looking for my ancestors. I was searching the 1812 pensions and found a maiden name for a wife (collateral line). I was impressed. This will be a great resource when it is done. Wish it was further along. I’ve waited years for these records to be published. I am afraid the one I have waited so long for, that there will be nothing on him. He was in the navy, American Prisoners of War Held at Halifax Mitchell, David Prisoner 6577. Rank: Midshipman. From: Rattle Snake, Sloop of War. Captured: 11 July 1814 off Shelburne by HMS Leander Interned: 15 July 1814. Discharged: 14 Mar 1815. Received from Leander. Union 7 Transport for Salem. This is the last record I have been able to find of him. Stephen Taylor, my ancestor, served in the War of 1812 from Sullivan Co TN. I have his records but am interested in the names of other men in his unit. Thank you for the excellent job you are doing to make more records available. Thanks so much for all your hard work to bring these documents to light. I look forward to the day when you reach the Ms. I remain hopeful that the file for my 1812 ancestor will provide information that will allow me to continue with that line. OMG, 95,000 images and you are just on B !! THANK YOU so much for providing this resource. Thank you for a wonderful web site. I am looking forward to you getting to the D’s as in Dunegan. This web site is a wonderful resource, thank you so much. If you need someone to help with entering data I would love to be of assistance!!! Thanks. Photos of the paper records are so much better than microfilm. Through this program, I located the maiden name of my 3rd. 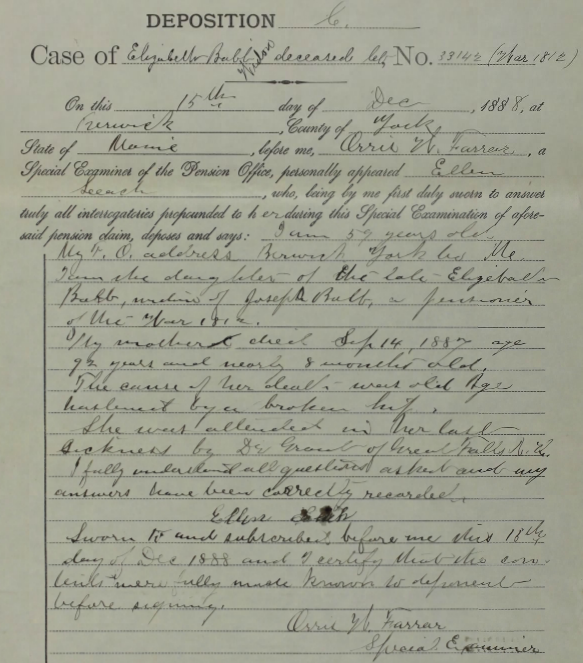 Great-Grandmother, HANNAH CHAPMAN TUGGLE, the wife of WILLIAM WALKER TUGGLE….through the contents of his War of 1812 Pension Application…documenting her maiden name of CHAPMAN. I had searched for 25 years for this supportive documentation. Thank you. The images from the War of 1812 Pension Files are free on the site through the partnership with the FGS, but if there are other images on the site that will help you in your research, you can subscribe and access them from any computer you like. I hope I live long enough for you to get to the Gs. I do have the pension papers of Thomas Graves and that is the only source for his marriage to Olive Owens in 1843. It is on her application for the pension. I’ll be happy when you reach “H” ! One of my ancestors, Gideon Hawley, and 3 of his sons fought in the War of 1812. According to family stories, his widow received a pension, but I’ve never been able to uncover anything else. Nor could I get any response from the “Daughters of the War of 1812.” Help!